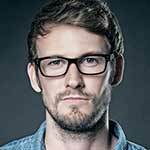 Each mattress company is trying to find that little something that makes them unique. Ameena is pursuing the humanitarian route, offering a buy a bed and give a bed program. The Ameena Dream movement wants your help to ensure everyone has a comfortable bed to sleep on. 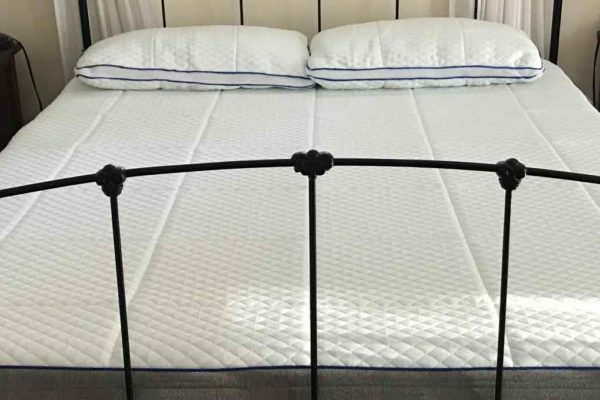 Read my Ameena Mattress Review to learn if this bed has the right softness and support for you. The Ameena is a soft mattress. I give it a 4 out of 10 on the firmness rating (10 being the firmest.) The top Energex and gel foam layers provide a very plush feel that still has some bounce. This feel comes from the top responsive layer, blending with the memory foam layer beneath. I would recommend this bed for side sleepers and lighter back sleepers. The downside of the high level of comfort is a somewhat limited support. The Ameena does have 6 inches of high-density foam support, but I found that it was a bit too soft for me. I tend to prefer firmer beds, so no surprise there. I did notice the Ameena bed had a good overall dispersal of pressure points. Side sleepers shouldn’t find any pressure on the hips or shoulders. Sitting on the edge, the customer will find they sink quite a bit. The positive aspect of the softer foam top layers is motion isolation. I could jump around on this mattress and never disturb the person sleeping next to me. Normally this lack of motion would also mean an unresponsive bed. Ameena fixes this with their Energex top layer. I believe it is similar to latex, responding quicker than traditional memory foam. Foam beds deal with a lot of heat issues. Ameena combats the excess heat with their Thermaphase Gel Memory Foam. 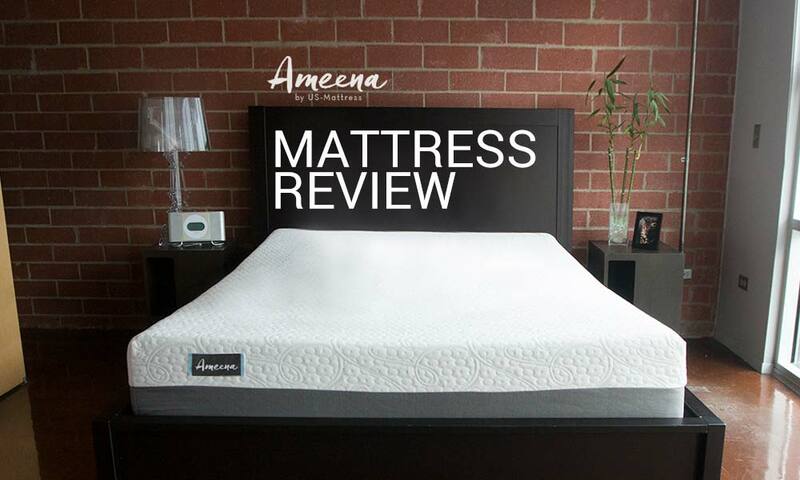 I have found zero complaints of heat retention from customers during our Ameena mattress review. The gel foam pulls the heat away from the sleeper and down through the mattress. The Ameena mattress did have some smell, but it goes away in a day or two. Ameena uses Low VOC materials, and everything is CertiPUR-US approved. Customers can sleep well knowing they are on a safe mattress. The Energex material on top of the memory foam creates a responsive, yet soft feel. While the Ameena wasn’t the coolest mattress, it does do a good job dispersing heat for the sleeper. Want to feel good about yourself when you buy your bed. Ameena donates a bed to a person or family in need for every bed purchased. The Ameena bed uses a similar setup to other mattresses, building their bed from 3 different layers. Each layer plays an important role in how you sleep. A nicely patterned design, made of a fabric that stays cool. 2″ of ENERGEX Foam acts similar to Latex and provides a responsive comfortable top layer. 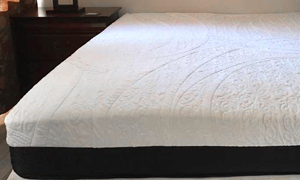 2″ of Thermaphase Gel Memory Foam not only provide the softness, but also pull the heat away from the sleeper. This layer comforms to your body and eases any points of pressure. 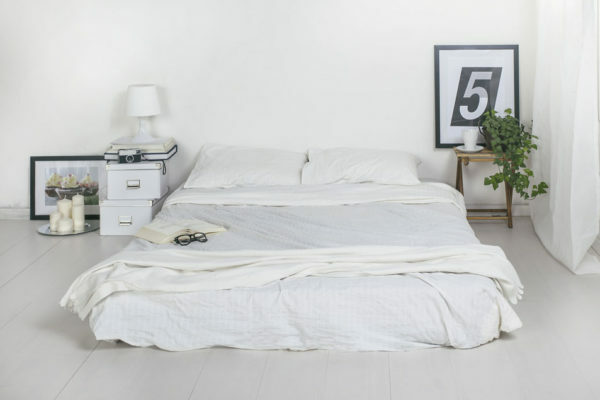 6″ of high-density foam create the foundation and support for the entire mattress. The Ameena is right in the middle when it comes to mattress price. The Queen costs $800 which is about what I would expect for this type of mattress. 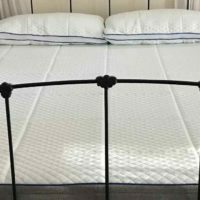 I would love to hear what you think about the price in the Ameena mattress review comments section. For a limited time, customers can get $60 off with Ameena Promo Codes. Ameena offers a 120 night risk free trial period that goes along with the Ameena codes. Customers should expect a medium-soft mattress that has a good amount of bounce. Ideal for side sleepers, the gel memory foam layer does a good job dispersing your weight evenly. It doesn’t have the best edge support, but it does stay cool. To top it off, Ameena is certainly one of the most giving companies with their Ameena Dream movement. If you choose to buy their bed, they will donate one to a family in need.